Plants can be divided into two broad categories based on their means of reproduction: flowering plants (spermatophytes) and non-flowering plants (crytogams). Non-flowering plants can, in turn, be sub-divided into five main types. Read on to learn more. These simple plants reproduce by means of spores, and can be found in both terrestrial and aquatic environments. They range from single-celled bacteria to seaweeds. Mosses, also called Bryophytes, do not have roots, but rather use tiny hair-like structures to penetrate the soil. They require a damp environment in order to survive, and reproduce by means of spores. 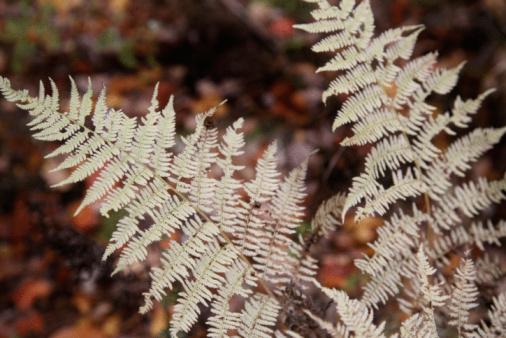 Ferns bear feather-like leaves, which grow above the ground while their stem and roots grow underground. They reproduce by means of spores that grow under their leaves. These are evergreen trees that bear needle-like leaves and reproduce by means of seeds that form inside the conifer's cones. Fungi lack the green pigment chlorophyll, which is used by green plants to convert sunlight into food. What Is the Difference Between a Spore & a Pollen Grain?